On 29th March, PM Theresa May met staff at our Alex Begg factory in Ayr, Scotland, as part of a day-long tour to hear the views of businesses and other organisations across the UK, one year before the European Union exit. Alex Begg was founded in Scotland in 1866 and creates quality woven scarves and throws for sale across the world, including key markets in Japan and the USA. Brexit is posing a threat to companies like Alex Begg, with a global customer base, and it is vital that leaving the EU will not lead to additional barriers to free trade. 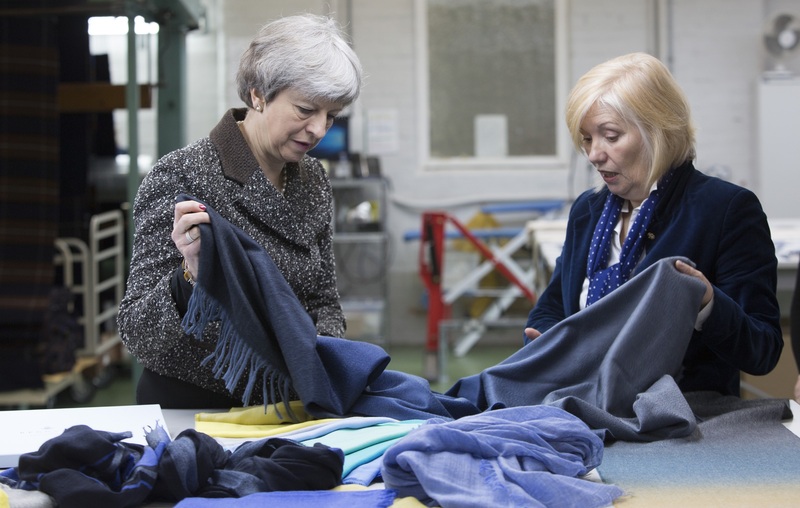 “We are delighted that the Prime Minister has taken the time to visit our business which has 150 years of heritage of designing and manufacturing luxury scarves and throws in the West coast of Scotland. Much of our recent sales growth and corresponding increase in employment has been achieved in export markets and we welcomed discussing the importance of trading terms both within the EU and beyond”, said Ian Laird Managing Director for Alex Begg. Ian Laird, spoke to PM Theresa May about the importance of developing, attracting and retaining the rights skills, including people with expert competence from outside of the UK. He also described how the current uncertainty around what the agreement between UK and EU will look like is making planning and investment in facilities in Scotland difficult. “It was great to see the creativity and craftsmanship on display at Alex Begg, and the passion that goes into making each cashmere scarf. It was also good to hear about the investment that the company is making in the development of skills, and manufacturing capability. I am confident an outward-looking company like Alex Begg is perfectly placed to seize the advantages our post-Brexit future will provide”, Theresa May said after the meeting.